This Valentine’s Day – why not make a special gift in honor of your friends, family members and colleagues. It’s a great way to send greetings to let them know how much you appreciate them on this day of love and friendship. 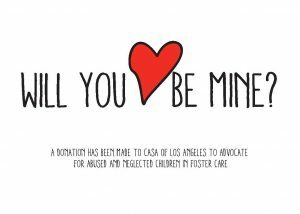 Through CASA of Los Angeles’ Valentine’s Day Campaign, you simply make a donation and receive cards to send. 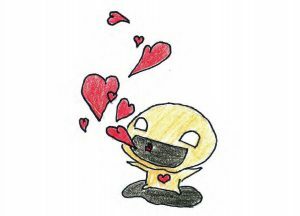 Your recipient receives an adorable custom card featuring a drawing by one of our CASA children who, with the help of her CASA volunteer, was placed in a safe and permanent home. 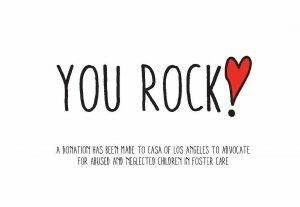 With a donation amount of your choice (suggested minimum donation of $5/per card), you will help us continue our services of advocating for children in LA County’s child welfare system who have been abused and neglected. Simply indicate which Valentine’s Day cards you would like along with the number of cards you need in the comments section. For more information, please contact Marie Carpenter at mcarpenter@casala.org or 323.859.2888 x6328.